Revolution and war: is it all just a little bit of history repeating? I read this article and found it very interesting, thought it might be something for you. 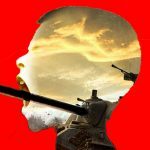 The article is called How Science Can Decode the Laws of History and Predict US Political Violence and is located at http://evonomics.com/cliodynamics-can-science-decode-laws-history/. Originally published at The Conversation in 2012. They say history always repeats itself – empires rise and fall, economies boom and bust – but is there a way to map and predict the dynamical processes of history? The new and highly controversial discipline cliodynamics is the most recent attempt to transform history into science. When the French Assembly of Notables frustrated attempts by the royal government to fix the state fiscal crisis in 1788, because they did not want to pay taxes, these aristocrats did not intend to trigger the French Revolution, during which many of them ended up guillotined or exiled. Yet this is precisely what happened. When the slave-owning elites of South Carolina declared their secession from the Federal Union in December 1860, they did not intend to trigger a bloody civil war that caused more than 600,000 deaths, killed one quarter of military-aged white Southerners, and resulted in the loss of most of their own wealth, when their slaves were freed. Yet this is precisely what happened. Now, when the radical Tea Party Republicans refuse to negotiate with the Democrats to achieve a compromise, they probably don’t intend to push the United States into default, trigger a massive economic crisis, widespread urban riots, political assassinations and terrorism, and bloody clashes between the Tea Party and the Occupy Movement. Yet – well, this hasn’t happened but cliodynamics indicates that during the next decade the United States will be unusually vulnerable to an outbreak of serious political violence. Cliodynamics originates from Clio, the Greek muse of history. Despite a common misconception, the cliodynamics approach is not to argue by analogy with past events. This is an incorrect way of learning lessons from history – the historical record is very rich and varied, so finding historical examples to support almost any argument is easy. Instead, the adherents of cliodynamics treat historical record just as, say, evolutionary biologists treat the palaeontological record. Theories are constructed and based on general principles and tested empirically with comprehensive databases. In short, we use the standard scientific method that worked so well in physics, biology, and many social sciences. My colleague Herbert Gintis compares cliodynamics to aviation. You cannot predict when a plane will crash, but you can study the black box data to determine the causes of crash and figure out how to fix them. You certainly don’t fly an aeroplane that has known problems. Similarly, you don’t put additional stresses on the social system that is already in fragile equilibrium; rather you should try to fix the underlying causes. Clearly our knowledge about why states collapse and civil wars break out is nowhere near the state of aeroplane design. But recently we’ve made a lot of progress. Consider the “structural-demographic theory” that was first proposed by the sociologist Jack Goldstone and subsequently developed and tested with data by others, including myself. 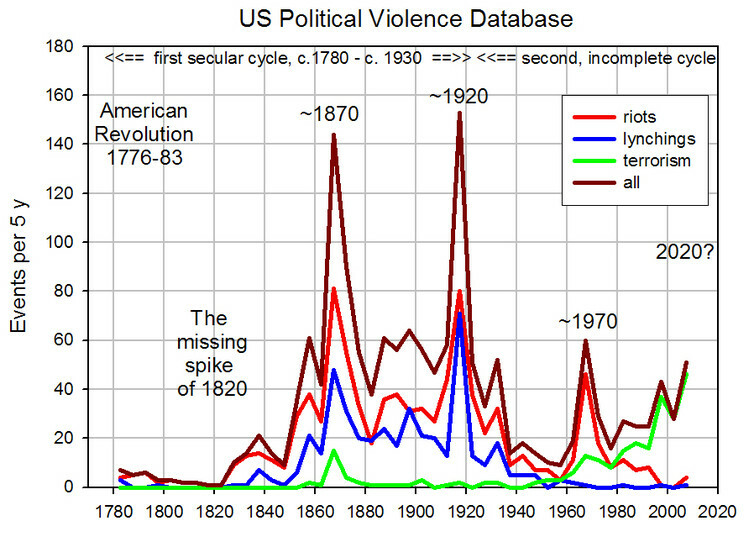 The theory explains major outbreaks of political violence, such as the French Revolution or American Civil War, by focusing on several interrelated processes. One is the falling or stagnating living standards of the general population. But contrary to the widely held view, popular discontent by itself is not a sufficient cause of a civil war or a revolution. 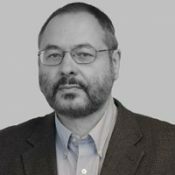 A more important factor is what has been called “elite overproduction” – that is, the appearance of too many elite candidates vying for a limited supply of power positions within the government and the economy. As written about in my book War and Peace and War, elite overproduction results in intense intra-elite competition, polarisation, and conflict that ultimately takes violent forms. It is important to stress the limitations of this approach. The theory does not predict when and how actual violence will break out, only structural conditions that make such an outcome likely. Think of a forest in which deadwood has been accumulating for many years. We don’t know what will start the fire – it could be a lightning strike during a storm, or a careless match thrown away. But sooner or later such a precipitating spark will arrive, and there will be a massive conflagration. Nobody could predict that Mohamed Bouazizi, a fruit vendor in Tunisia, would decide to publicly immolate himself. But this act of a desperate individual had huge consequences because the structural conditions in Tunisia were ripe for revolution. The structural-demographic theory has been tested by several investigators on many historical societies. The theory predicts very long-term cycles in which periods when societies are internally at peace are succeeded by waves of unrest. Both of these “integrative” and “disintegrative” phases are about a century long. The theory focuses entirely on the dynamics of political instability within states as external wars have a logic of their own (in fact, it is typically societies which are in their integrative phases that prosecute successful wars of external conquest). Our empirical investigations of a variety of historical societies confirm that they go through structural-demographic cycles. But on top of the long cycles are often superimposed shorter oscillations with periods of roughly 50 years. It appears that people eventually tire of incessant fighting, so during the disintegrative phases human generations experiencing a lot of fighting tend to alternate with relatively peaceful ones. Additionally, I found that other structural-demographic indicators moved in a cyclical fashion in ways that were correlated with the waxing and waning of political violence. In the last three or four decades real wages of unskilled workers stagnated. The incomes of the top one percent, on the other hand, grew explosively, leading to ever increasing economic inequality. Signs of elite overproduction include growing demand for educational credentials: tuition rates at elite colleges that rise much faster than inflation and the exploding numbers of new MBAs and JDs. Intra-elite competition and conflict are indicated by rampant polarisation within the US Congress and increasing legislative deadlock. Finally, the declining health of government finances can be traced by the growth of federal debt. Each of these trends has been noted and commented upon. But what is not broadly appreciated is that each did not develop in isolation; they are actually interconnected at a fundamental level. Moreover, our historical research shows that this combination of trends is typical of historical societies that are in the pre-crisis phase. An outbreak of political violence comparable to French Revolution or Civil War is not inevitable, or even likely. American society is much more resilient than France of Ancien Régime. Still, we should not forget that Antebellum America was a reasonable, if imperfect democracy. Nevertheless, its elites were unable to contain their conflicts within constitutional bounds. American political elites today need to take this historical lesson to heart. The Economy Isn't A Machine. It's Organic and Constantly Evolving.